Few swimmers have a specific move named after them, but Larisa Ilchenko has always been special and she made every one of her many international victories dramatic. The Ilchenko is a strategic move at the end of an open water race where a swimmer who has been drafting for most of the race outsprints their competitors to win the race. She and other renowned Russian swimmers like 2-time FINA world champion Yevgeny Bezruchenko and 2-time FINA world champion Vladimir Dyatchin did the same - and are bringing their sense of excitement to the open water swimming world in their native Russia. The TYR Champions Cup has races in Moscow, Ветрено, Lipetsk, Veliky Novgorod and a growing number of locations that has attracted over 5,000 swimmers up to the age of 75 in its first four years. 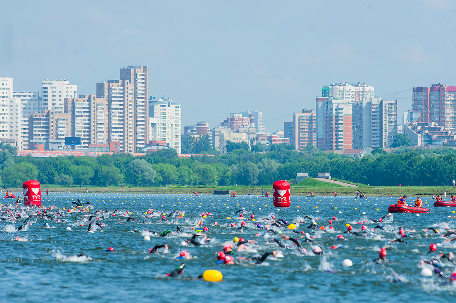 The TYR Champions Cup in Ветрено offers a 1 km, 1.85 km, 3 km, 12 km, and 24 km river swims and a 5 km and 15 km SwimRun held in July in the Rybinsk Reservoir. 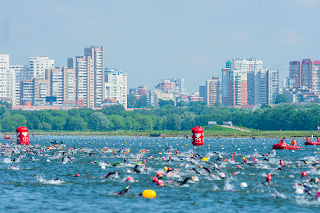 While the shorter races (1 km, 1.852 km and 3 km) are held around Cherkasovsky Cape in the Rybinsk Reservoir, the 12 km race is a point-to-point course, and the 24 km race is held in the River Sit with the first 12 km against the current and the last 12 km is downstream is a flat river.